Information in this guide found at the National Archives. 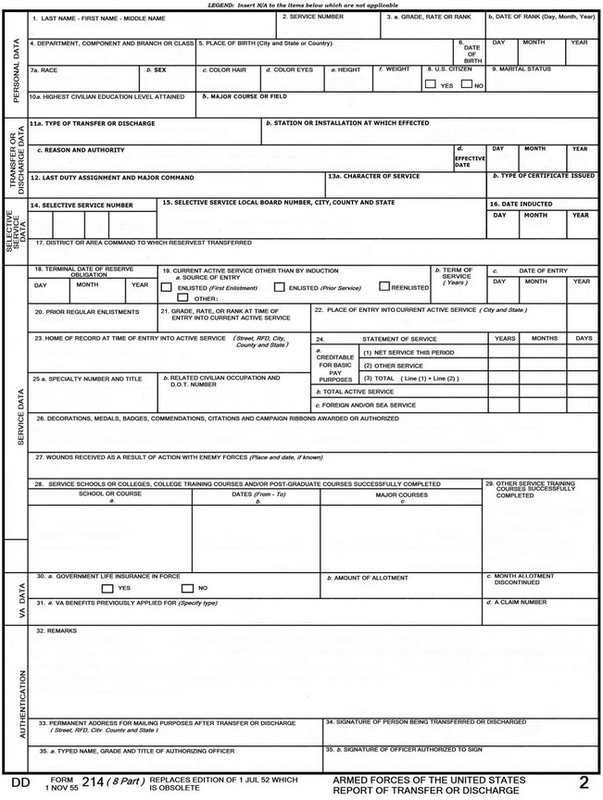 What is a DD Form 214? Why do I need one? A DD Form 214 proves military service. Obtaining a copy is essential if you want access to many of the benefits and services available to you. Often referred to as the Report of Separation (freedom documents, promotion to Mr. or Ms. citation, authorization for liberal grooming standards, etc…), this document contains very important information necessary for accessing benefits, retirement, employment, and membership in Veterans Service Organizations. Separation information: type of separation (ex: honorable), character of service, authority and reason for separation, separation and reenlistment eligibility codes). Before January 1, 1950 several similar forms were used, including the WD AGO 53, WD AGO 55, WD AGO 53-55, NAVPERS 553, NAVMC 78PD, and the NAVCG 553. What does a DD 214 look like? Who can make the request? In the event a next-of-kin is making the request, proof of death of the veteran must be provided. Acceptable proof include: a death certificate, a letter from the funeral home, or a published obituary. Follow the online instructions. There are also other available online requests through the archives website such as requesting medals. The SF-180 is the recommended method for requesting your records. Provide as much information as possible and send copies of any service documents available- this will help the process and leave little room for error. For records affected by the 1973 Fire, also include: Place of discharge, last assigned unit, and place of entry into service, if known. Authorized Third Party Requesters: lawyers, doctors, historians, etc., may submit requests for information from individual records with the veteran’s, or next-of-kin’s, signed and dated authorization. State their relation to the individual and the purpose of the request. All authorizations should specify exactly what the veteran (or next-of-kin) is allowing to be released to a third party. The veteran (or next-of-kin if the veteran is deceased) must authorize the release of any information available to the public. Make sure you double check through the deceased documents as a copy may already be there. 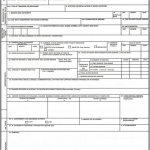 If providing authorization, the authorization must 1) be in writing, 2) specify what additional information or copies that the NRPC may release and 3) include the signature of the veteran or next-of-kin. The NPRC can only release limited information. For more information click here. If your request is urgent (e.g. upcoming surgery, funeral, etc.) and there is a deadline associated with your request, please provide this information in the “Comments” section of eVetRecs or in the “Purpose” section of the SF-180 form and fax it to the Customer Service Team at (314) 801-0764. If your burial request involves internment at a Department of Veterans Affairs National Cemetery, contact the National Cemetery Scheduling Office at (800) 535-1117 or click HERE. If the veteran is not going to be interned at a National Cemetery, the requester may fax the SF-180 or signature page from eVetRecs (including signature of the next of kin and proof of death) to the Customer Service Team at (314) 801-0764).